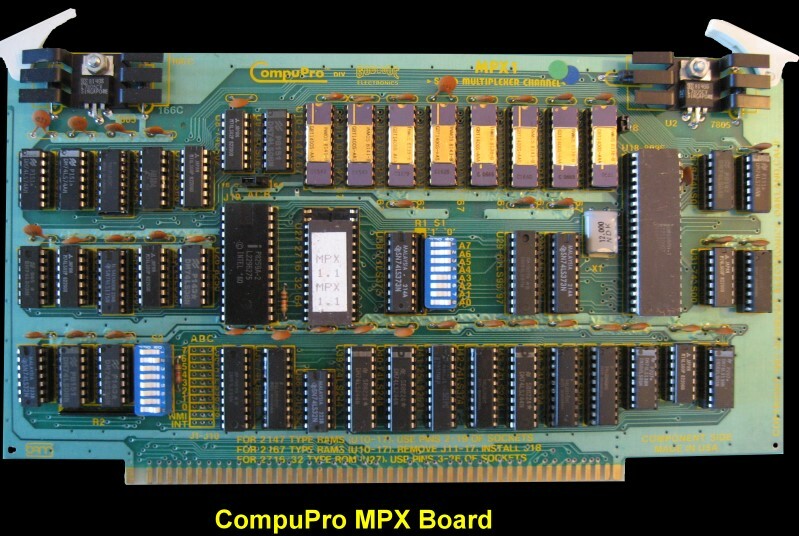 The MPX-1 board was a very specilized board invented by CompuPro. It was in essence an interrupt pre-processor board. It took the interrupt servicing work away from the main system CPU and handled it efficiently on this board. The MPX-1 had its own on-board processor, an Intel 8085AH-1 running at 6 MHz. This processor was supported by either 4K or 16K of fast static RAM and up to 8K of EPROM. In addition, a flexible 8259A interrupt controller monitored the eight vectored interrupt lines on the S-100 Bus. None of these local resources took up any address space on the S-100 Bus. When an interrupt request occurred on one of the vectored interrupt lines, the interrupt response was handled by the on-board interrupt controller and CPU, taking up no processing time on the bus. When needed, the MPX-1 could access any system resource on the bus. This means that it could talk to any I/O port or memory location on the bus. It did this by requesting the bus from the permanent master on a cycle-by-cycle basis. This request/grant procedure was fully arbitrated to 16 levels as provided for by the IEEE 696/S-100 bus standard. This allowed up to 16 such devices to exist in a system at any given time. Multiple MPX-l's could even be used. The uses of the MPX-1 was potentially vast. Obvious uses would include terminal interrupt handlers, print spoolers, task allocation and management, and resource control. A unique feature of the MPX-1 was that it could load execution code from the system memory so that the MPX-l's function could be altered dynamically. The manual for this board can be obtained here. There was a good description of this board in the May 1983 Microsystems Journal which can be seen here.